1305261488 -With CRIMINAL PROCEDURE FOR THE CRIMINAL JUSTICE PROFESSIONAL, Twelfth Edition, you’ll have everything you need to develop a comprehensive understanding of the legal rights, duties, and liabilities of criminal justice professionals–from individual rights to arrest, search and seizure, confessions, pretrial identifications, trials, and appeals. 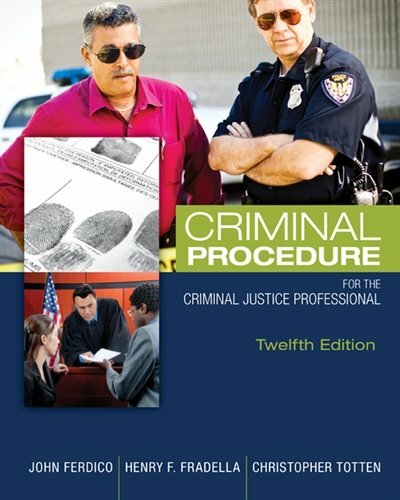 This readable, up-to-date text presents a uniquely practical, real-life approach to criminal procedure, making it an ideal reference book as you begin your career. Using plain English–clear and concise statements of criminal procedure law and understandable explanations of the reasoning behind the law–authors John N. Ferdico, Henry F. Fradella, and Christopher Totten clarify potentially confusing and obscure legal matters. Additionally, they reduce the complexity of criminal procedure law into simple, straightforward guidelines and recommendations, illustrated with interesting examples of actual cases.